Once you have decided on the style of marquee best suited to your event, the next step is to explore the marquee interior options that are available through C & J Rentals. At C & J we offer linings, swags, carpets and lighting options to create your atmosphere and bring your event to life! We encourage all of our customers to visit our showroom marquee where we display a full range of accessories for you to choose from. We will listen to your ideas and make suggestions, helping you to reach the right decisions for the big day. At C&J Rentals we work with a number of interior suppliers so that if you require something specific such as a themed bar or dance floor, we will happily source it for you. 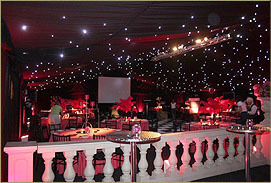 To discuss marquee interiors in more detail or to make a general enquiry, please do not hesitate to contact us.